Joint between metacarpal bones and proximal phalanges of toes of the forefoot. Joins the metacarpus to the digits (toes or fingers). Joint between metatarsal bones and proximal phalanges of toes of the hind foot. Joins the metatarsus to the digits (toes). Relating to, or located towards, the surface opposite the dorsal surface of the forefoot. For humans this is the palm of the hand. For cats and dogs, this is the underside of the forefoot. For humans this is the sole of the foot. For cats and dogs, this is the underside of the hind foot. Limb pads located at the metacarpus under the metacarpophalangeal (MCP) joint, or at the metatarsus under the metatarsophalangeal (MTP) joint. 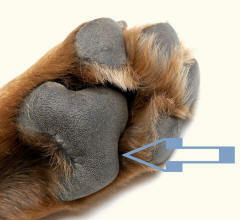 These are the largest of the pads on the palmar or plantar surface of the feet of dogs and cats. Heel pads is the term generally used by trackers and pet associations, and is the term used by Revealing Paws. Also known as palmar pads, plantar pads, metacarpal pads, metatarsal pads and palm pads.